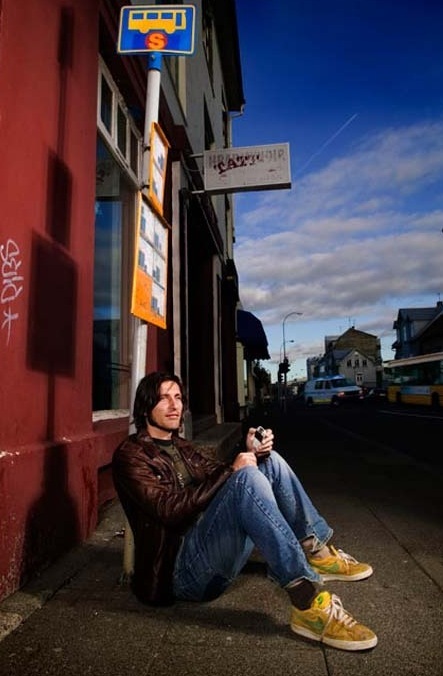 Eberg is a young Icelandic musician who made his debut in 2003. With his electronica-meets-indie rock sound, Eberg quickly made a name for himself. His first album, Plastic Lion, was originally a limited edition Iceland-only release, with 50 CDs packaged in handmade wooden cases. The profits raised from the sale of these 50 first exclusive copies allowed the band to make more CDs, with a more conventional packaging this time. Plastic Lion was then distributed by Bad Taste in Iceland by Rotator in the UK the next year. Eberg’s second album, Voff Voff, followed in the footsteps of his debut, still mixing electronic arrangements, traditional instruments and samples. The album got rave reviews among critics and bloggers and some of the singles (most notably “Inside Your Head”) became hits in the UK, getting airplay on UK hit-maker radio BBC Radio 1. On his third album, Antidote, Eberg manages to create a perfect balance of moods and styles. On this largely varied album, he flirts with indie rock, brings in hints of trip-hop and embraces dreampop. Poignant and quirky, his songs are at times nostalgic, at times hopeful, but always earnest. There are more fuzzed-up guitars this time around but there is still a fair amount of experimentation with textures and sounds. Sharp and concise, and always recognizably Eberg, Antidote is what critics were expecting from Eberg and he has delivered. I could be nuts, but this is beautiful work. the “I killed Laura Palmer” bumper sticker in the video was just an added bonus.